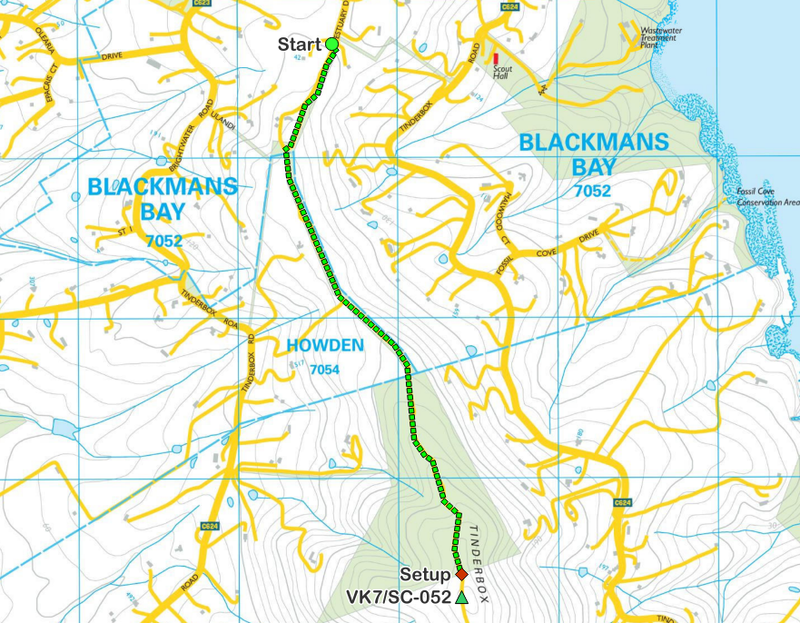 On Saturday the 11th of October 2014 I undertook my first SOTA activation and the first activation for VK7/SC-052 – Tinderbox Hills. It was a rushed affair with work and family meaning I was not properly prepared come Saturday morning. But after an initial stumbling block (15 minutes into my walk, realising I’d left my batteries at home) I did successfully activate the summit. The summit is easily accessible via a good track maintained by Kingborough Council. With both easy parking found at the end of Estuary Drive, and then a clearly signposted start of the track. 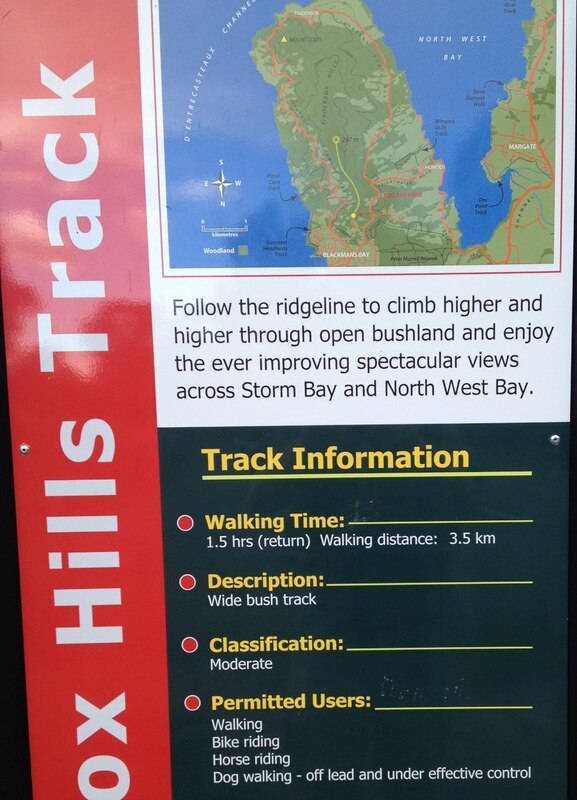 And as per the sign, it’s a ‘moderate’ walk taking at most 45 minutes to get to the top. Start point (car park) for VK/SC-052. Along the way you’re presented with rather nice views both east and west – as after all, you’re walking along the single ridgeline of a peinsula. To the west you look down over Northwest Bay to Margate, and out to the east you can clearly see Iron Pot, Opossum Bay and onto Tasman Peninsula – and also clear to New Zealand (but obviously not visible). And if you look back down the track you can see Mt. Wellington rising above the tree line. Overview of the walk for VK/SC-052. There are a couple of rocky areas and some step bits to keep the heart moving, however I did see two ladies arrive at the top after me arrive on mountain bikes. 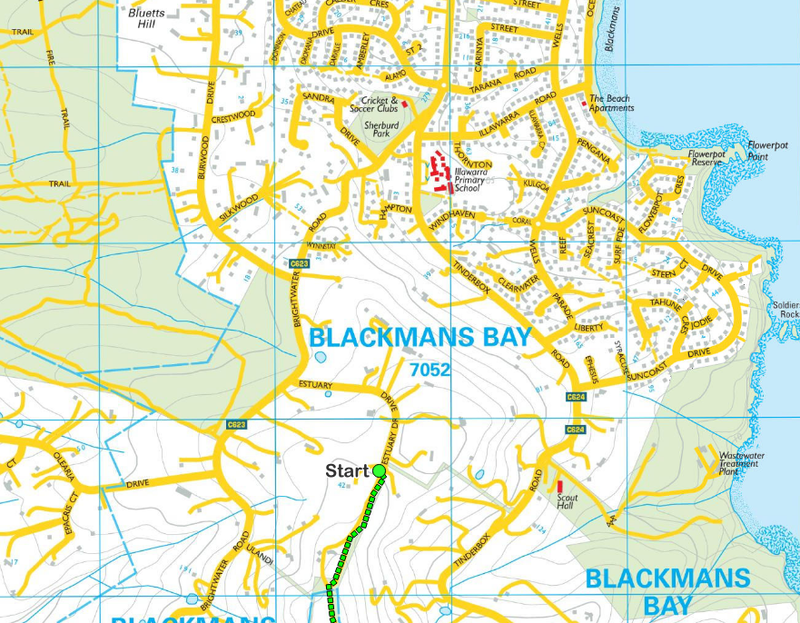 Of note though – and something readily seen on the maps from LIST map – is that the summit is actually on private land. This is further emphasised by signs from the Council as there is no fence line. However, the boundary is between about 10 to 15 meters vertically of the summit, and luckily SOTA rules are that you must be within 25 meters of the summit (vertically). And better yet, the sign-post provided for a reasonable support for my squid pole extend and 2m half-wave dipole attached. 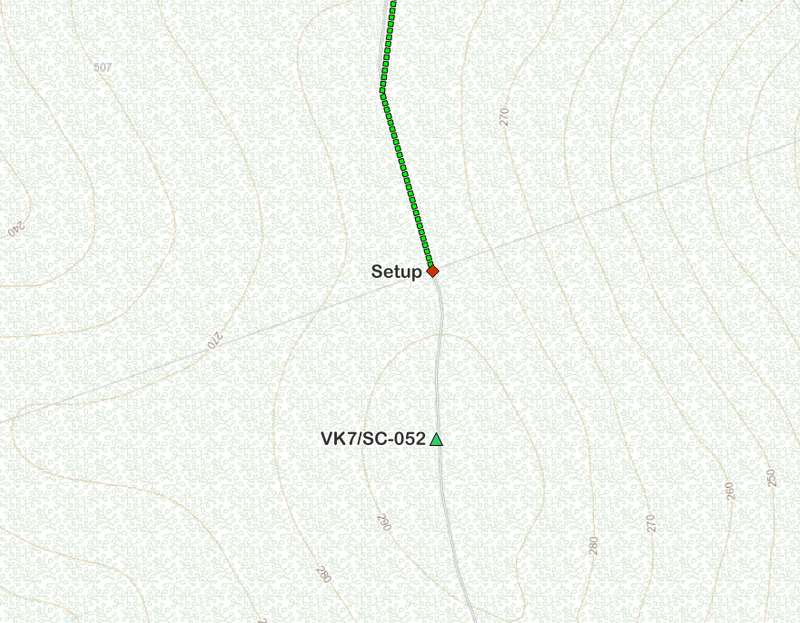 Map showing set-up location right on the private boundary line – noting the summit of VK/SC-052 is actually on private land. My plans for the day were to activate on 2m FM, 2m SSB and 40m SSB. As it was, on 2m I only made three contacts (not enough for an activation), so lucky 40m than filled in the remainder by providing 18 contacts. I’m hoping that in future I might have more success on 2m – especially some SSB – but I think I’ll need to make sure I attempt to make more locals aware of the activation. Indeed, I would love to be able to activate some of the local peaks (Mt. Wellington – VK7/SC-001 and Mt. Rumney – VK7/SC-045) with nothing but 2m. But we’ll have to see what can be done. But that all said, a fun time was had and some lessons were learn’t – such as, I carried far more battery power than I needed, and seeing they were two 4Ah SLABs, it would’ve been great to have taken only one. And I’m definitely looking to get organised and get another activation happening soon! My pack for the day, 2m dipole hanging out either side, and squid pole standing tall on the left. Top of the ridgeline heading towards the private property sign. No excuses for ending up on private land. A slighly skewed (the track is straight) panorama looking east. Looking east from where I setup. A local who gave me a start on the way back down. Had no intention of moving at all – so I took a portrait. My main (only) radio for 2m SSB is my FT-817ND. Putting out a whopping 5W, I do hope that one day I can look at a bit more power. To that end, I’ve always intended a linear amplifier. Nothing huge to start with, just something getting me say 25W or more – maybe 50W. Recently I came across an Italian company that appears to produce some cheap units that may be suitable. They have a VHF range that can be seen here. Reviews seem to be what you’d expect for in that price range, so maybe it’s an option. However, that got me thinking it’d be great to build my own when I get to that point. So I started looking to see what was around. First, I knew Mini Kits had some options such as the RA VHF Amplifier Kit. In general though, there doesn’t seem to be that many kits. So I thought I’d also look for some plans. First was one that looks kind of achievable. Using a single high power transistor for about 100W output was the OZ2OE 144MHz PA with MRF317. But from there only a couple of other options were really found (on a very brief search), but the top end was a kW amplifier with dual valves – the LA0BY 144 MHz high power amplifier for 2 x 4CX250B. Anyway, that’s a ways off for now. Have a few other things to get going first – finalising my new home setup for starters (more pics of that soon).